As I chugged away on the dishes from dinner last night, the little guy came eagerly into the living room, bearing one of the books he'd purchased at a book sale out in Western Maryland last summer. It was an old collection of Robert Browning's poems and plays, and by old, I mean it was printed up in 1895. He'd bought it for a couple of bucks because, well, he thought something that old was kind of cool. Which it is. What he wanted to share, though, was a scrap of paper he'd found within. It had served duty as a bookmark, no doubt…but a very, very long time ago. It appeared to be a worship schedule and bulletin, but it wasn't one from a church. It had been published by the chaplain of the USS New York. But not the current USS New York. 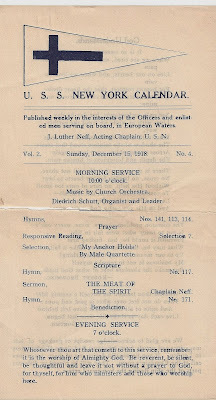 It was the bulletin for a worship service dated December 15, 1918. On the back, there were little shipboard news blurbs and...poems. Browning, not surprisingly, but also Goethe, which ended up being a little surprising. We did a little googling and wiki-ing. The USS New York (BB-34) was a battleship commissioned in 1911, one that served in World Wars 1 and 2. 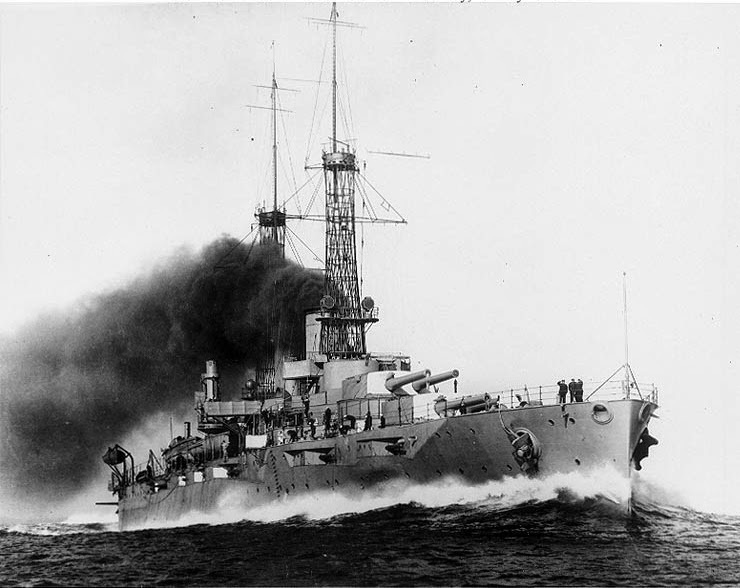 It saw action in both conflicts, in WWI being the only US vessel to sink a U-Boat. The U-Boat accidentally crashed into it and sank, but still. You take what you can get. It saw major action in WWII, laying down fire for Operation Torch in North Africa. It also provided support for the landing at Iwo Jima, and the landing at Okinawa. After the war, the BB-34 was "retired" as a target ship for the Bikini Atoll nuclear tests, and managed to survive both the Able and the Baker tests. Tough hunk of steel, evidently. It was subsequently used as a target ship, and sunk near Pearl Harbor in 1948. So here in our house, without our knowing, was most likely a book of poems that in World War One sailed the seas with the chaplain on a steampunk-era battleship. 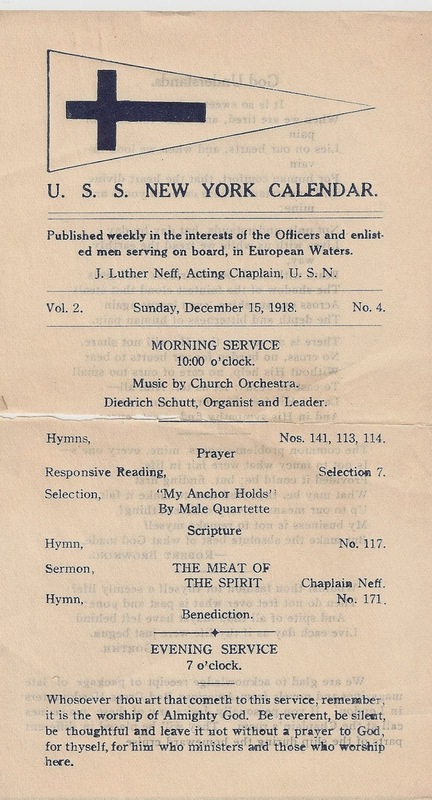 And in that book of poems, a worship service bulletin from said battleship, one printed at sea just about a month after the first World War had ended. Amazing, the stuff you find lying around the house.